(Nanowerk News) Aydogan Ozcan, whose invention of a novel lensless imaging technology for use in telemedicine could radically transform global health care, has now taken his work a step further — or tinier: The UCLA engineer has created a miniature microscope, the world's smallest and lightest for telemedicine applications. The microscope, unveiled in a paper published online in the journal Lab on a Chip ("Compact, light-weight and cost-effective microscope based on lensless incoherent holography for telemedicine applications"), builds on imaging technology known as LUCAS (Lensless Ultra-wide-field Cell Monitoring Array platform based on Shadow imaging), which was developed by Ozcan, an assistant professor of electrical engineering at the UCLA Henry Samueli School of Engineering and Applied Science and a researcher at UCLA's California NanoSystems Institute. 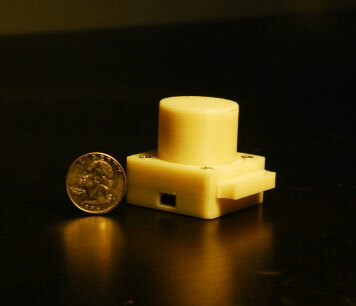 The prototype for the lensless microscope developed at UCLA has the approximate diameter of a US Quarter. The microscope only weighs 46 grams, about as much as a large egg. The lensless microscope, in addition to being far more compact and lightweight than conventional microscopes, also obviates the need for a trained technicians to analyze the images produced — images are analyzed by computer so that results are available instantaneously. Weighing 46 grams — approximately as much as a large egg — the microscope is a self-contained imaging device. The only external attachments necessary are a USB connection to a smart-phone, PDA or computer, which supplies the microscope with power and allows images to be uploaded for conversion into results and then sent to a hospital.